I’ve been experiencing higher response times and lower throughput in my server last weeks. 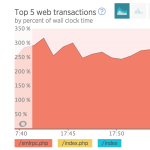 I use NewRelic to monitor server’s performance so I found out that queries to /xmlrpc.php were having a gigantic impact in site’s performance. Googling about that issue I found this post by Hugo Dias about fixing the problem denying access in .htaccess file. However my server doesn’t use apache but nginx so I couldn’t apply that snippet directly. Fortunately porting the snippet to nginx is not so hard with StackOverflow’s help.